Invasive plants can cause a range of environmental problems. Invasive plants suffocate other plant life, and some are poisonous to animals. Some can damage buildings as they grow. Many are not native to Britain, so the pests and diseases that stop them spreading in their countries of origin are not present here. 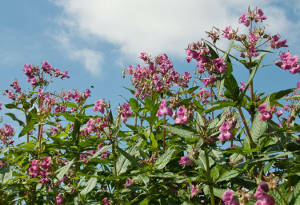 Some of these invasive plants grow in grass verges or along river banks. There are also many aquatic species such as Floating Pennywort, Azolla, Parrots feather, New Zealand Pygmyweed and Water Primrose – find out more on the GB non-native species secretariat website. If you spot any of the following plants in South Gloucestershire, please report them to us. If we are responsible for the land where they are growing, we will deal with them, and if not, we may ask the landowner to deal with them to stop them spreading. If you spot them on your own land, you should get rid of them quickly – seek specialist advice on what to do. It is illegal to plant them, or cause them to spread in any way. This is a native biennial plant that grows up to one metre tall. It has a large, densely packed head of bright yellow flowers. It is very poisonous to horses, cattle and other animals, so must be kept away from agricultural land. It can also be toxic to humans, and you must avoid touching it. Ragwort is subject to the Weeds Act of 1959, so landowners can be served with enforcement notices where necessary to make sure they stop it from spreading. This is a perennial plant that forms dense stands of tall, hollow, speckled canes during summer, which die back in autumn. During spring, reddish purple shoots appear and the plant grows rapidly – up to three metres (10 feet) tall. As leaves unfurl, the plant turns green. Knotweed can damage hard surfaces such as tarmac as it grows. It can grow through the floors of houses, occasionally even through the foundations. It is best to deal with it while it is still small. If Japanese Knotweed is found on council land, we will treat it chemically between May and October each year. We only treat Japanese Knotweed between these months as this is when the weed is most receptive to treatment but we will take reports throughout the year. The treatment process can take three to four years to be successful. Chemical controls: The plant is resilient to cutting, vigorously sprouting from the roots. The most effective method of control is by herbicide application close to the flowering stage in late summer or autumn. Non-Chemical controls: Digging out is possible, but due to the depth that the roots can penetrate, regrowth usually occurs. Try and remove as much of the root as possible, then repeatedly destroy any regrowth. Alternatively, it can be dried out on site before burning. 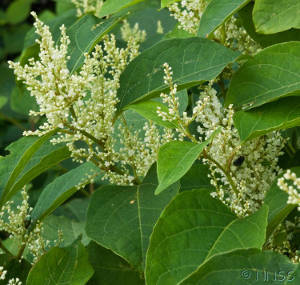 Japanese Knotweed should not be disposed of in your rubbish or garden waste bin. This perennial can grow up to seven metres (20 feet) tall. It looks like a larger version of Common Hogweed or Cow Parsley. It has stout, dark reddish-purple stems and spotted leaf stalks that are hollow and produce sturdy bristles. It flowers from mid-May to July, with white flowers clustered into an umbrella head that can be up to 0.8 metres (2.5 feet) across. 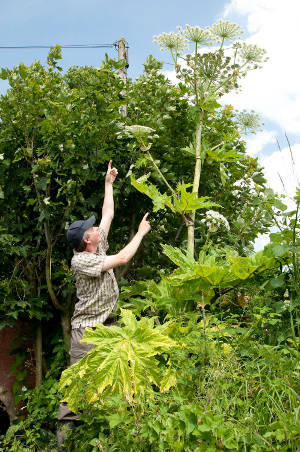 Giant Hogweed can cause severe blisters on your skin – if you touch it, wash the area immediately.